CRAFT: The Vicious Vikings is a free game. This means that the source code is available to be studied, modified, and distributed. Most projects look for help with testing, documentation, graphics, etc., as well. CRAFT: The Vicious Vikings, or more generally Craft, is real-time strategy game that resembles the proprietary Warcraft, Command & Conquer, and Dune II. The game was created by Uwe Beyer and the latest stable release is version 3.5 released on October 27, 1997. The game is licensed under the GNU General Public License. 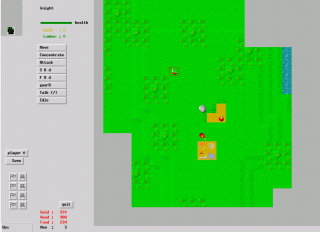 Craft was an early X11 game and one of the earliest real time strategy games for Linux as well one of the earliest free software ones. It was mentioned in Linux Journal and by CNN and the game's popularity can be shown by the fact that it was submitted to the Linux Game Tome by the site's original creator Tessa Lau on September 1, 1998 as part of her documenting games from SunSITE's Linux games directories. The game currently has an average rating of four stars out of five on the site. As the game died after the last release in 1997, and it no longer has a modern website, it is difficult to find for download (though you can find some links for downloading at the Linux Game Tome and through search engines). The website featured, as a joke, images from the comic strip Hägar the Horrible and is only now accessible through the Internet Archive (see links). As of June 10, 2009, Debian still had version 3.5 in its Etch (then oldstable) repositories, for these platforms: alpha amd64 arm i386 ia64 mips mipsel powerpc s390 sparc; hppa; m68k. For RPM based systems there are both source and regular RPMs for Suse circulating the Internet. Some of these have been tested on other RPM-based distributions such as Fedora. The player is a Viking who angers the leader of his settlement after a drinking binge. After "several unpleasantries" the player and his two fellow drinking buddies are forced to exit the village. During their exile they establish a new tribe. Noting that the player is "obviously even too lazy to work" his fellows elect him to be the King. Thereafter only time will tell whether or not he is a great leader and empire builder or "just another one of life's losers." There are also "a few more of your sort" around trying to build up their own nations competing with them as well. With these challenges, the player is left to lead his citizens and nation. In Craft you must lead your outcast vikings from starvation into a thriving economy. You must feed your army, research technologies, conquer islands, and trade with far-away countries. You win when you are the sole kingdom on the map. To move across the map you must select where you want to view on the mini-map with the mouse and it lacks the keyboard movement usually available in real time strategy games but also contains a version of mouse scrolling that involves moving the cursor to a given edge of the map and clicking down. You can not order units to move using the mini-map like in some games. The game features network multiplayer as well as combat and trade with computer opponents. The game begins by default on your new island, probably meant to represent one of the many small Scandinavian islands. The size and amount of resources on your island and the shape of the map is randomly generated each time. Selecting against the island option at the beginning has you play on a larger continent instead, which limits naval play. The island mode is more similar to Warcraft II while turned off it is more like the original Warcraft. You start with a knight, ostensibly representing the player, and two workers who presumably represent his two drinking buddies. From there one of the workers must build a town hall to start gathering resources and construction. There are three resources: gold, food and lumber. Food can be acquired by building farms and is needed to prevent the starvation of units, lumber from cutting down tress and is needed for building, and gold is acquired from mining. Various new units can be trained such as more workers, pawns, more knights, scouts, scientists, merchants, catapults, and ships. There is a population limit of 70 units and you usually need new buildings to create them as well as to complete other economic and military tasks. These buildings include camps, mills, smiths, universities, forts, markets, docks, more town halls, and of course farms. Various buildings either have different requirements or recommendations about where or how to be built. There are also different trainable limitations for several military units. The game has speed controls for both players and enemies, a feature not present in other contemporary proprietary strategy games such as Warcraft II or Age of Empires but which is available later titles such as Stronghold (cheats were available to speed up building and mining in some of those games). The game also features many other innovative at the time features such as hills and mounds affecting travel speed, starvation of units if lacking food, and the construction of moats, traps, mounds or walls. The historical, although comical, setting was also singular in a time when futuristic and fantasy real time strategy was popularized by Command & Conquer and Warcraft. This was before titles like Age of Empires or Rise of Nations made historical equally popular. Sustained games are unlikely given the lack of a save or load function in the game and the game has no sound or music. Craft was considered relatively backward graphically for its era. The user interface and gameplay was also sometimes criticized as clunky and installation was considered difficult in in many of its forms.Builds can suffer from redraw problems if another window is loaded or if the player switches workspaces and the game can also seize up or lose mouse control. Piga Software said "[though] the game is not entirely stable but it is well worth a play or two" in its overiew of free or GNU/Linux-compatible real-time strategy games to play whilst waiting for advancements to Gambas Genie. This page was last edited on 28 March 2016, at 16:47.